Definition: Cleft lip and cleft palate, also known as orofacial cleft, are birth defects that occur when a baby’s lip or mouth do not form properly during pregnancy. 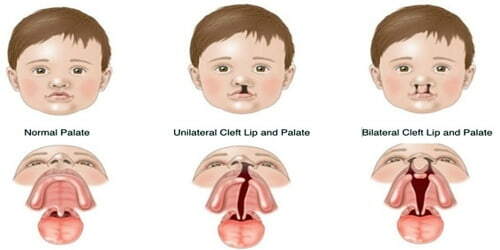 This is a group of conditions that includes cleft lip (CL), cleft palate (CP), and both together (CLP). Cleft lip and cleft palate are openings or split in the upper lip, the roof of the mouth (palate) or both. A cleft palate occurs when the roof of the mouth does not close properly during a baby’s early development inside the womb. The palate is made up of two parts, either of which can be cleft – the hard palate and the soft palate. The hard palate is a bony portion in the front of the roof of our mouth. The soft palate is located at the back of the mouth and is made up of soft tissue. The cause is unknown in most cases. Risk factors include smoking during pregnancy, diabetes, obesity, an older mother, and certain medications (such as some used to treat seizures). Cleft lip and cleft palate can often be diagnosed during pregnancy with an ultrasound exam. Children with a cleft lip with or without a cleft palate or a cleft palate alone often have problems with feeding and speaking clearly and can have ear infections. They also might have hearing problems and problems with their teeth. A cleft lip or palate can be successfully treated with surgery. 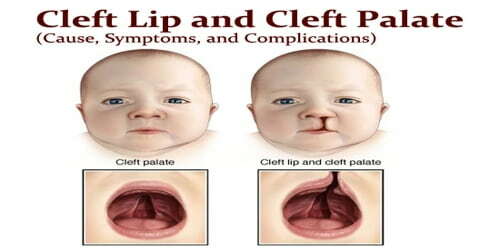 This is often done in the first few months of life for cleft lip and before eighteen months for cleft palate. Speech therapy and dental care may also be needed. With appropriate treatment, outcomes are good. Causes and Risk Factors: The cause of cleft palate and lip isn’t known, but doctors believe that the defects occur because of both genetic and environmental factors. Genetics can play a role in the development of clefts if one or both parents pass down a gene that makes a cleft palate or lips more likely. The mother or the father can pass on genes that cause clefting, either alone or as part of a genetic syndrome that includes a cleft lip or cleft palate as one of its signs. In some cases, babies inherit a gene that makes them more likely to develop a cleft, and then an environmental trigger actually causes the cleft to occur. Like the many families of children with birth defects, CDC wants to find out what causes them. Understanding the factors that are more common among babies with a birth defect will help us learn more about the causes. CDC funds the Centers for Birth Defects Research and Prevention, which collaborate on large studies such as the National Birth Defects Prevention Study (NBDPS; births 1997-2011) and the Birth Defects Study To Evaluate Pregnancy exposureS (BD-STEPS; began with births in 2014), to understand the causes of and risks for birth defects, including orofacial clefts. Males are more likely to have a cleft lip with or without cleft palate. Cleft palate without cleft lip is more common in females. In the United States, cleft lip and palate are reportedly most common in Native Americans and least common in African-Americans. In most cases, the split in the lip that is characteristic of a cleft is the most noticeable sign of the defect. Milk may come out of the baby’s nose while feeding because the barrier between the mouth and nose is abnormal. It’s also possible for children with a cleft to have dental problems, such as missing teeth or having extra teeth. Complications: Children with cleft lip with or without cleft palate face a variety of challenges, depending on the type and severity of the cleft. Individuals with cleft also face many middle ear infections which may eventually lead to hearing loss. The Eustachian tubes and external ear canals may be angled or tortuous, leading to food or other contamination of a part of the body that is normally self-cleaning. The hearing is related to learning to speak.